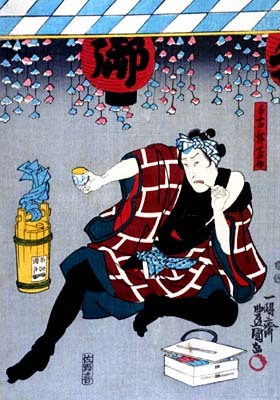 The Tokiwazu-based dance "Kioi Jishi Kabuki no Hanakago", commonly called "Kioi Jishi", was staged for the first time in the 4th lunar month of 1851 at the Nakamuraza, starring Ichikawa Kodanji IV, Bandô Takesaburô I, Onoe Kikujirô II and Iwai Kumesaburô III. This dance was the main item of the soga matsuri, which was held the 28th of May. The dance Kioi Jishi takes place during the Sannô Matsuri, held once a year in and around the Hie Shrine in the district of Akasaka Sannô. A lively crowd gathered for the festival. There are geisha dressed in a special festival costum named tekomai, a group of young firemen and their two bosses called Tsurukichi and Kamekichi. "Kioi Jishi" is series of short and festive dances. The geisha start with their festive kiyari ondo. Then, it is the turn of Tsurukichi and Kamekichi, who start their show with a dance about the revenge of the famous Soga brothers, first highlight of "Kioi Jishi". The two men plays the roles of Soga Gorô Tokimune and Soga Jûrô Sukenari. Two geisha play the roles of the courtesans Kewaizaka no Shôshô (Gorô's lover) and Ôiso no Tora (Jûrô's lover). The next dance is about the pleasure quarter. The following one is a slow-paced dance called bôfura odori (literally "the mosquito larva dance"). Then 4 young firemen perform a dance about sake. The second highlight, and last item of "Kioi Jishi", is a new year lion dance done by Tsurukichi and Kamekichi*. One animates the lion mask and the other the lion tail. 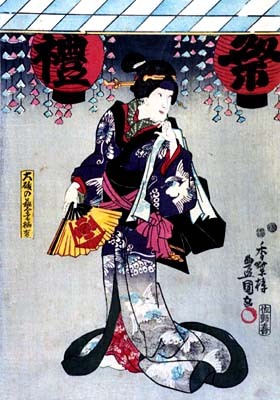 The geisha use their fan to symbolize the butterflies which excite the lion. The two bosses suddenly go out of the lion puppet, wearing each a mask, the faces of Hyottoko and Okame, a comical couple of many popular dances. "Kioi Jishi" ends with the lion puppet pose and the flapping of the geisha' fans. (*) For the new year celebration, it was a custom for 2 men to animate a lion puppet and to visit all the neighborhood's homes in order to bring good luck.